It has almost been a month since I could show off some proper minis. Sorry for the delay. I hope last week’s Clan Coyote Lambda article was helpful. I’ve managed to finish the Executioner E along with having the Timber Wolf Z mostly done and most of the battle armor at least cleaned up with some paint on them. I forgot how annoying painting those little beasts could be. The Summoner Z has seen some work. Most of the pieces are filed and cleaned but I have to do some work on the left arm and the ATM launcher before I can assemble it and start painting. This is the third resculpted Executioner I have built. I have one of the original sculpts that I have not had the time or motivation to assemble (I thought it was the resculpt when I ordered it. Oops!). The other two versions that I have built were the A and D configurations. Both of them are very easy builds with different arms needed and an SRM6 from a Gargoyle. All of the parts are available from IWM. One of these days I will paint just a plain simple Prime. Thanks go to Hellbie for the arms for the D configuration. The E is a little more expensive that some of the other variants. For this one, you also need to replace the torso. 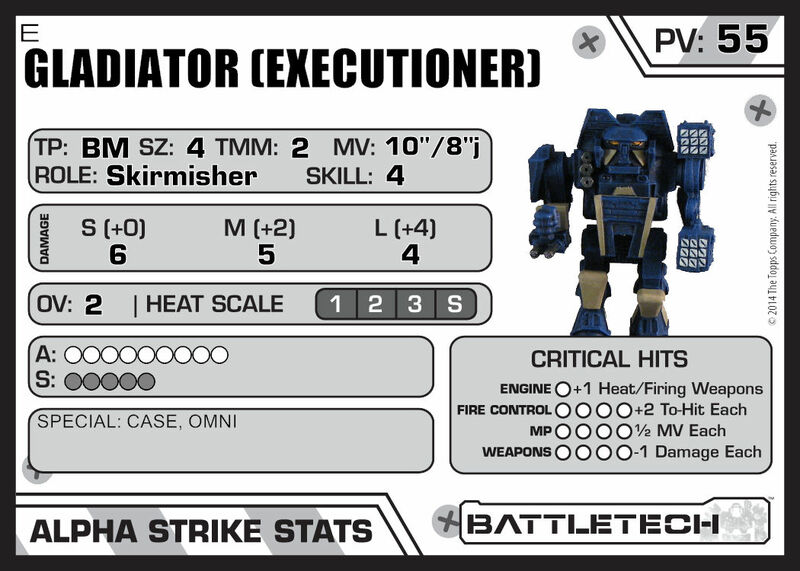 What I used was the whole miniature, Gladiator E left arm, Gladiator E ATM launcher, and the Gladiator E torso. The right arm is the same as the prime. You do have extra parts left over for this one like the torso and left arm. I’m not sure what I’m going to do with the extra on this one yet. There are a lot of parts you need to build it as a whole mini (legs, jump jets, front lower torso, and back center post). I have an extra left arm already. I suspect it will be hacked apart and placed on a hex for a destroyed mech marker. The mini assembled as easily as any other 3050 clan omni like the Summoner or Hellbringer. A different leg pose isn’t going to happen without some serious work but it is a decent stance. It comes in 11 parts (legs, 4 jump jets, torso, front lower torso, back center post, left arm, right arm, and lasers for under right arm). The E configuration has one more part than the Prime. The most “difficult” portion of this is keeping the torso upright. Arms, legs, jump jets, and weapons position nicely with plenty of surface area to hold securely. So how does this big guy work? This one is pretty straight forward. 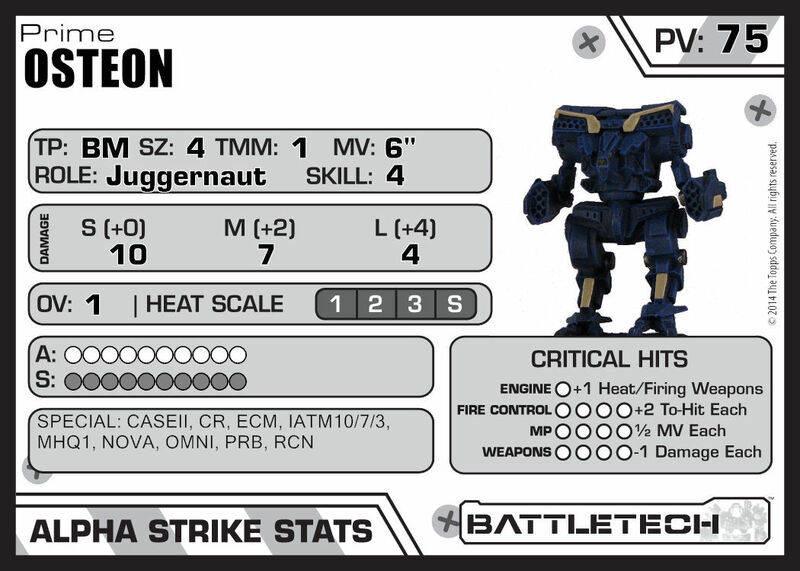 It isn’t the big, plodding, high damage juggernaut like the Osteon. It has a similar damage profile to the Timber Wolf and Summoner. It also has the similar movement profiles and it jumps. Treat it like an oversized heavy mech. Keep it moving and let it hit anything and everything in its path. The only specials it has are OMNI and CASE. The OMNI is going to allow you to carry around either the Gnomes or the Elementals. The CASE will just protect you from ammo explosions. No fancy iATMs with special munitions like the Summoner, Timber Wolf, or Osteon. 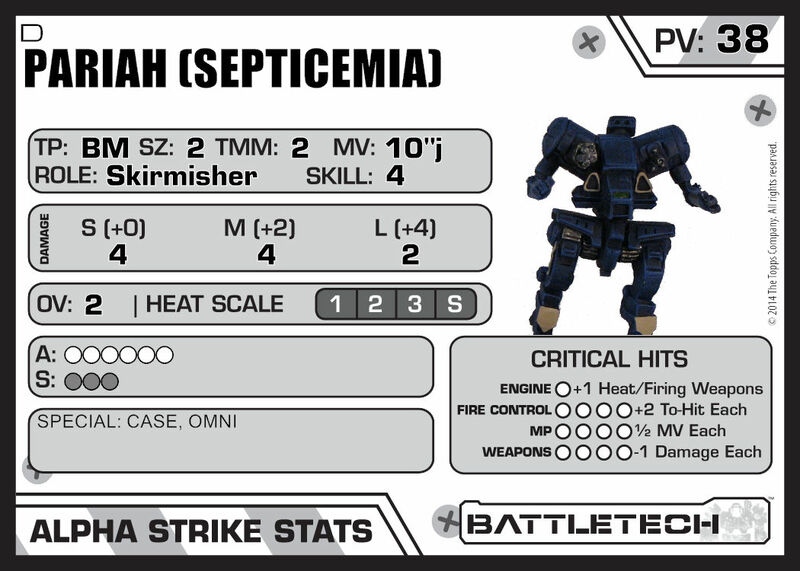 It also does not have the NOVA system that is common on most of my other mechs. I was curious what would happen if the ATM 9s were replaced with iATM 9s. Why are you giving me that look? Everything else seems to have iATMs. Why not make it a clean sweep? If I’m crunching the numbers correctly, it looks like short range damage would go up by 1 while the medium and long range damages stay the same. It also looks like the Overheat Value would also go up by 1. The Point Value of this new beast would increase by three points to 58. It would also gain iATM(3/2/1).